The Galileo spacecraft took this image of Europa, which is about the size of Earth's moon, in 1996. Image credit: NASA. 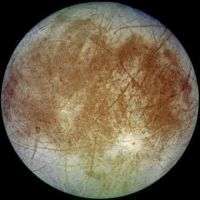 (PhysOrg.com) -- Scientists used to think that Jupiter and its moons - and most other bodies orbiting far from the Sun - were cold, icy, and probably barren. When the Voyager spacecraft flew by in the late '70s, its images of liquid on Jupiter's moons surprised scientists. The images showed that the moon Io had liquid sulfur volcanoes, and the moon Europa contained a liquid ocean under the frozen crust. Scientists weren't sure why Europa's liquid oceans didn't freeze when they're so far from the Sun. Generally, researchers thought that Jupiter kept Europa's oceans warm by generating tidal forces on the moon, which caused the moon to flex during its eccentric orbit, and this energy caused the oceans to heat up. A top layer of ice would insulate the liquid underneath, trapping the heat. Now, a recent study published in Nature has proposed another heating method, one that could provide considerably larger amounts of heat to maintain more energetic liquid oceans on distant moons. As author Robert Tyler, an oceanographer from the University of Washington, explains, Jupiter may keep Europa's oceans warm by generating large planetary waves on the moon. Since Europa tilts on its axis (just like the Earth and many other celestial bodies do), a previously unconsidered kind of tidal force could generate planetary waves called Rossby waves. Owing to our planet's oblique orbit, Earth also has Rossby waves that travel from East to West across its oceans. Although Rossby waves travel quite slowly, at just a few kilometers per day, they can generate significant kinetic energy. Tyler calculated that if Europa has an axial tilt of just one degree, the resonance from Rossby waves would produce 7.3 x 1018 J of kinetic energy, which is two thousand times larger than that of the flow excited by the dominant tidal forces. If true, the warming method could mean that Europa's oceans aren't as calm as previously thought. Under the icy surface layer, very energetic oceans could be sloshing around, Tyler said. He added that the same warming method could apply to other moons of Jupiter and Saturn. Previous studies have suggested that energetic oceans could offer an environment with a higher potential for life, although other factors - such as the ocean's chemistry - would also play important roles. So , how comes Titan has no boiling water in his surface? Has no axial tilt enougth to generate rossby waves or is the methane an stopper to them? erm... Europa doesn't have waves on its surface either MVV. They are kilometres under the surface. Anyway , it was just a comment on the theory. If the mechanism in fact is responsible for something as notorius as Europa liquid oceans , them something at least simmilar sould be observerd in a similar setup. Titan's methane lakes could very well show evidence of this mechanism, but we have never actually seen them through Titan's dense atmosphere. Europa's surface could be evidense of inner turmoil. It's bumpy and cracked with several areas re-surfaced form liquid stores below. Seems like a possible meachanism ro me, although I would like to see a little more before I accept it over the tidal force modul. ah, you mean the surface lakes on Titan? Yeah, quite possibly.